Lake Kivu is a Great Rift Valley lake shared by Rwanda and D.R. Congo. it is located in western part of Rwanda, in 160km in north western part from Kigali. it covers an area of 2,700km2 and lies 1.460m above sea level, it’s 89km long with 48km wide, it’s average depth of 220m, and a maximum depth of 485m. it is one of the great lakes region of East Africa and lies within great rift valley of Africa. The lake is a good resort for watersports, like kayaking, jet skiing, boat riding and even swimming and beach sports. Lake Kivu play a vital role in water transportation of both countries, as it is used for transportation of people and their goods from or to both countries. and also there is a boat access(Munezero) connecting you to the other parts like Karongi and Rusizi and primate circuit of volcanoes and Nyungwe national parks, and lake kivu bluebird boats;a colorfully painted blue and white boats that offer tours of lake kivu, can be found in karongi part of lake. The lake is also a great source of fishes, people of both country work all night for catching the fishes,which tend to the development of society they live in. 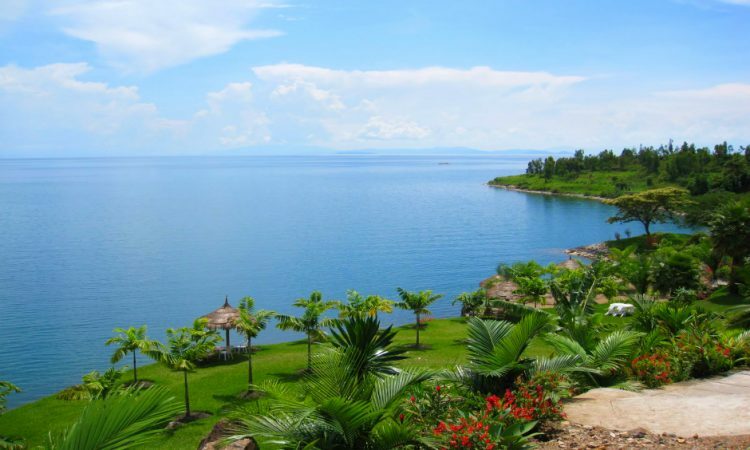 At the shorelines of lake kivu there hotels (like Kivu Serena hotel and steppe hotel), beaches (like new tam tam and Gisenyi public beaches), which are the beautiful places to relax in Rubavu district. The lake is providing best view of the birdlife, as it is near the congo-nile trail and gives access to the endemic albertine rift’s birds of the afro-montane of western region of Rwanda. at the shoreline of lake, You will find Bralirwa, also known in french as Brasseries et limonaderies du Rwanda, an internationally recognised and largest brewery and beverage company in Rwanda, it produces local beers like Mutziig, Primus, and even international brands like Guiness, Amstel and a range of soft drinks. The lake is a beneficial energy resort for both countries, as it has Methane gas to electricity plant, the world first plant that was developed in kivu lake in 2005, and the station started producing power in 2008. The plant is considered as a tourist attraction due to ecological value, and also has a rig which can be seen in the distance on Lake Kivu. The explore Rwanda tour is very pleased to recommend you, to this lovely and a very secure destination( home of entertainment), where you will see and get conected to the beautiful islands, hot springs and other beauties of gisenyi in Rwanda and Goma in DRCongo. enjoy the cool air blowing overninght, it is like no other place to stay overnight in the world than kivu lake and even study how it is playing a great role in people’s lives.